Summer Skills Academy, July 13, 2016 SOLD OUT! <br/>July 14, 2016 – JUST ADDED! Summer Skills Academy, July 13, 2016 SOLD OUT! July 14, 2016 – JUST ADDED! Participation is limited to 40 individuals and is expected to sell out quickly! Wednesday, July 13, 2016, 8:30 am – 4:00 pm – SOLD OUT! SUMMER SKILLS ACADEMY 2016 – Held over! Day 1 has sold out so we have added a second day for this hugely popular session – Thursday, July 14, 2016. The second day has now reached its minimum number of registrations required and is confirmed to proceed, but there is still space available – so register now! 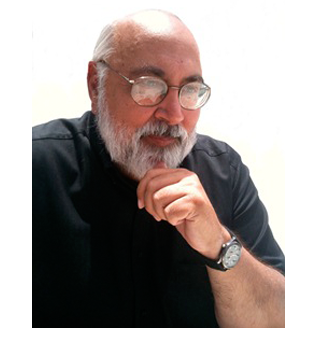 Mark Savickas is Adjunct Professor of Counselor Education at Kent State University. He also currently serves as Professor Extraordinaire at the University of Pretoria (South Africa) and Visiting Professor in the Institute for Employment Research at the University of Warwick (United Kingdom). His 90 articles, 50 book chapters and 500 presentations have dealt with vocational behaviour and career counselling. He has received honorary doctorates from the University of Lisbon (Portugal) and the University of Pretoria (South Africa). He is a fellow of the American Counseling Association, American Psychological Association, the American Psychological Society, and the National Career Development Association. Many counsellors are innovating their practices by shifting concentration from fostering career development to designing lives. This shift in practice has been prompted by changes in the social organization of work and occupations. To respond to these changes, some counsellors have turned to narrative models and methods for self-construction and identity shaping because this approach emphasizes life design rather than occupational choice. Looking at lives as novels being written focuses attention on the themes that activate and characterize individuals in both the work and partnership/family domains. From this narrative perspective, vocational interests are solutions to problems that people have experienced and work is an opportunity to actively master what has been passively suffered. This narrative approach to career counselling enables clients to fit work into their lives, rather than fit themselves to jobs. Thus, psychosocial mattering replaces occupational congruence as the goal of advising and counselling. This one-day training session will discuss and demonstrate practical techniques for using stories and articulating life themes to foster educational and career decision-making. Participants will learn how to integrate these techniques into their ongoing practice and may even use the techniques to better understand why they became advisors and counsellors and how their occupations allow them to advance their own life stories. Participants will be able to differentiate among vocational guidance, career coaching and career counselling. 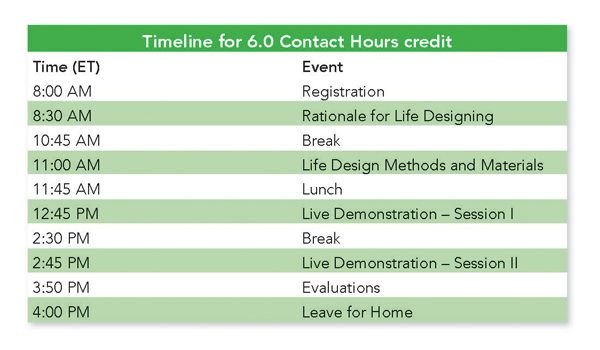 Participants will learn the conceptual model for the career intervention called Life Design Counselling. Participants will practice the methods for Life Design Counselling. Participants will complete the workbook entitled “My Career Story” and evaluate its usefulness. Participants will apply the interpretive framework for the Career Construction Interview to the live demonstration. If 2 or more of you attend from the same organization and register at the same time, you can save 10%. During Early Bird you would pay only $176 each! Note that there are lots of festivals taking place in Toronto, so rooms are filling up – if you plan to attend – book your room early! Useful information, resources and tools I will be able to incorporate into my practice as well as in my personal life. Interactive presentation of content was very helpful. Hands-on skills and knowledge that are applicable in my work field. Benefited from considering expansive, new concepts as they apply to our department and my role. High-quality training content. Well-organized event. Great exercises and productive group discussions. Was practical and fun. Very knowledgeable and convincing presenters. The other attendees were active contributors and fun to spend the day with. Requests for cancellation(s) must be made by emailing your request to registration@ceric.ca. Cancellation requests must be received before June 30, 2016 at 5:00 pm ET. NO REFUNDS are granted after this date. For any questions, please contact Susan Phillips, CERIC Conference & Events Manager at susan@ceric.ca or 416.929.2510 x126.